In 1989, animator and former marine biologist Stephen Hillenburg wrote an unpublished educational comic book titled The Intertidal Zone. Ten years later, his original concept became a Nickelodeon television series that has ballooned into the highest rated show on the roster of MTV Networks generating thirteen billion dollars – you read correctly – in merchandising revenue. The so-called children’s story has a wry/sarcastic/sometimes idiotic edge attracting at least as many adults to dedicated viewing. For the uninitiated: SpongeBob (Ethan Slater, who, in his Broadway debut, has to currently be the hardest working musical actor treading the boards) is the naively cheerful offspring of a sea sponge and a kitchen sponge-don’t ask. Our hero lives with his pet snail Gary (who meows) in a pineapple at the bottom of the sea. The young invertebrate works as fry cook at Krusty Krab Restaurant where he dreams of becoming a manager. Neighbors are dim, best friend Patrick Star (Danny Skinner-imagine John Candy with ducktail hair) and co-worker Squidward Q. Tentacles (Gavin Lee) a bad tempered, pessimistic octopus who lives in an Easter Island Moai. Other regular characters include SB’s boss, miserly Eugene Krabs (Brian Ray Norris) and his teenage daughter, Pearl (Jai’Len Christine Li Josey whose R & B vocals shake the rafters), the Texas born squirrel Sandy Cheeks (Lilli Cooper) a scientist who lives in an oak tree covered by an airtight glass dome outside of which she wears an astronaut’s suit (no idea how she got there), Sheldon Plankton (Wesley Taylor and a puppet), a small, green pickle-looking character with a Napoleon complex who owns fast food competitor Chum Bucket and, with his robot wife, Karen (Stephanie Hsu), schemes to steal the recipe for Krabby Patties… Intrigued? It’s easy to conjecture that Set/Costume Designer David Zinn (with ebullient Lighting Design by Kevin Adams) has never had a better time with a commission. From the moment one enters the transformed Palace Theatre, attention is beguiled. Shimmering, Mylar strip curtains cover everything vertical except the stage. An amusing video of underwater life (Peter Nigrini) plays across the pineapple-patterned curtain. As you’re serenaded by Hawaiian-shirted musicians beside an inflated palm tree, look carefully around. Coral is made out of wonderful assemblages of pool noodles and oversized party cups, there are sharks. Huge blue bubbles arch over and drip down from the proscenium. Colorful Rube Goldberg-like mechanisms run almost floor to ceiling on either side of the stage. Watching these ingenious set pieces kick into precise action is sheer delight. “Let us observe how the sun rises on a new day…” begins a French accented Narrator – a tribute to Jacques Cousteau? (Tom Kenny). The plot of this iteration (there have been two films) revolves around a volcano threatening to destroy Bikini Bottom. “Ladies and Gentlefish,” cries the Mayor (Gaelen Gilliland), “We need somebody to save us!” Suggestions range from sacrificing to the volcano to Patrick’s “Let’s all close our eyes and maybe it won’t happen.”A clock starts ticking. Plankton seizes the moment to convince panicked citizens they must have an escape pod built and flee, establishing a new community (called Chumville) elsewhere. He intends to collectively hypnotize his fellow townsmen into Chum Bucket customers while becoming a hero. A Shellathon will be produced to raise money. 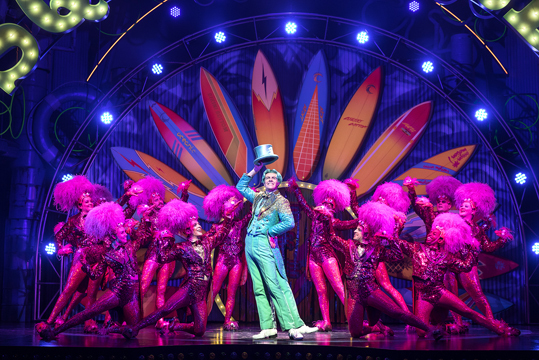 There’s a gathering that looks like undersea Barnum, a skateboarding punk rock band, a hip hop number, and one where sea anemones in pink sequins and feathers become unisex showgirls behind Squidward’s big, dedicated-to-mama, bring-the-house-down performance – a highlight.) Can Plankton’s dastardly plan be stopped?! It’s up to SpongeBob, Patrick, and Sandy to find a way! Those dedicated to Bikini Bottom and its inhabitants may be reassured that depicting the beloved characters without unwieldy costumes actually works. Along with the uber-creative Zinn, Hair Designer Charles G. Laponte and Make-Up Designer Joe DuludeI II help actors display just enough in tandem with characterization to bring the cartoon world to life. Ultimate credit goes to Director Tina Landau whose eye and ear for detail adds credibility and whose imaginative staging captivates. Wait until you see the volcano! Though SpongeBob is neither yellow not square, the terrific, multitalented Ethan Slater gives him just the right Pollyanna attitude and youthful inflection. Lithe, limber movement worthy of an acrobat puts the unwitting sponge in positions one might more easily draw. Danny Skinner’s Patrick exhibits dopey, sincere expression and comic delivery that reflect the obtuse starfish like a mirror. Gavin Lee ably manages Squidward’s four legs (a construction of genius) which bend like his own, striking poses and skillfully tap dancing. The actor’s Eyeore-like tone embodies his octopus perfectly, while hands curl backwards like the animation. Brian Ray Norris’s oversized boxing glove-like claws and perpetually bent arms ride tandem with Mr. Krab’s gravelly bluster. I found Lilli Cooper’s Sandy a bit too grounded and Wesley Taylor’s Plankton oily, but unfamiliar. Sound effects made by and for the group also put us in their world. The cast, to a person, sings well. Kyle Jarrow’s book employs signature expressions, expanding and embroidering while maintaining unique personalities. The show represents prejudice, friendship, community, confidence, and courage as much as immersing itself in fun. Christopher Gattelli creates a wide range of high spirited choreography replete with fish-like gesture. The musical’s problem, ignored by ninety percent of this exuberant audience, is its music and lyrics (arranged/orchestrated by Tom Kitt) which are almost uniformly generic/cliché. One would assume among the wide range of pop and rock contributors, someone would have availed him/herself of the wealth of fantastical specifics. Lack of context might be explained by drawing on material written before the show. It didn’t work for Sting in an otherwise worthy vehicle and was part of the reason for the failure of Woody Allen’s Bullets Over Broadway.